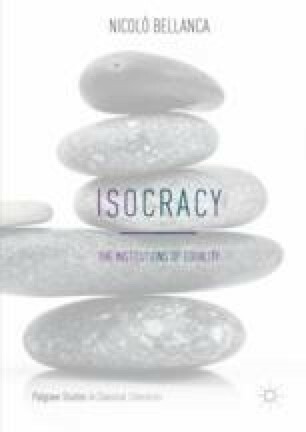 In this chapter, the economic institutions of Isocracy are identified. Capitalism needs to be subdivided and emptied to favour forms of economic pluralism. In competition with the traditional firm, there is the cooperative controlled by shares, managed by members, some of which contribute with their work, while others bring venture capital (the labour–capital partnership). The institutional circuit in which currency circulates (which trades the goods and transfers the resources over time) is distinct from that in which money circulates (which allows the accumulation of capital). Currency and money can convert into each other in rationed amounts, in order to prevent the marginalisation, by financial capitalism, of the markets in which value in use is exchanged. A key role is played by the bodies that manage common goods. In this sector, the ownership of commons is assigned to fiduciary institutions that are bound to hold and manage them on behalf of everyone, and especially future generations. Among the measures of economic pluralism, we remind again of the partial disconnection of personal income from employment, to protect workers in those cases where remuneration is reduced or becomes risky. A source for funding the decoupling is the “social dividend”: revenues deriving from the return of socialised capital. Another source comes from the incomes of enterprises in the sector of common goods. A third source is the “social salary”: a basket of goods that society deems worthy of being universally provided at controlled prices. Finally, retrieving an idea originally elaborated by Thomas Paine in Agrarian Justice (1797), on reaching adulthood, every citizen receives an identical portfolio that includes shares of some of the medium-big enterprises of the country. This enables him to acquire proper financial wealth, the biggest part of which goes back to the community after his death through a form of taxation on inheritance that becomes progressive with the passage of generations. The last sections of the chapter are devoted to the redistribution of work and care time, and to the socialisation of investments. According to Bellanca, the institutional network made up of these pre-distribution strategies is able to regulate financial capitalism thereby progressively weakening its negative effects in terms of inequality and of overall dominion on the part of a restricted group over everyone else. Diem25 (Democracy in Europe Movement 2025). 2016. European New Deal. https://diem25.org/. Accessed September 15, 2017.
International Monetary Fund. 2014. World Economic Outlook. http://www.imf.org/external/pubs/ft/weo/2014/02/pdf/c3.pdf. Accessed September 15, 2017. National Trust. 2016/17. Annual Report. http://www.nationaltrustannualreport.org.uk/. Accessed September 15, 2017.